Vesna is a social, loving and happy teen who loves track and field, boy bands, hanging out with her friends and being with her family. 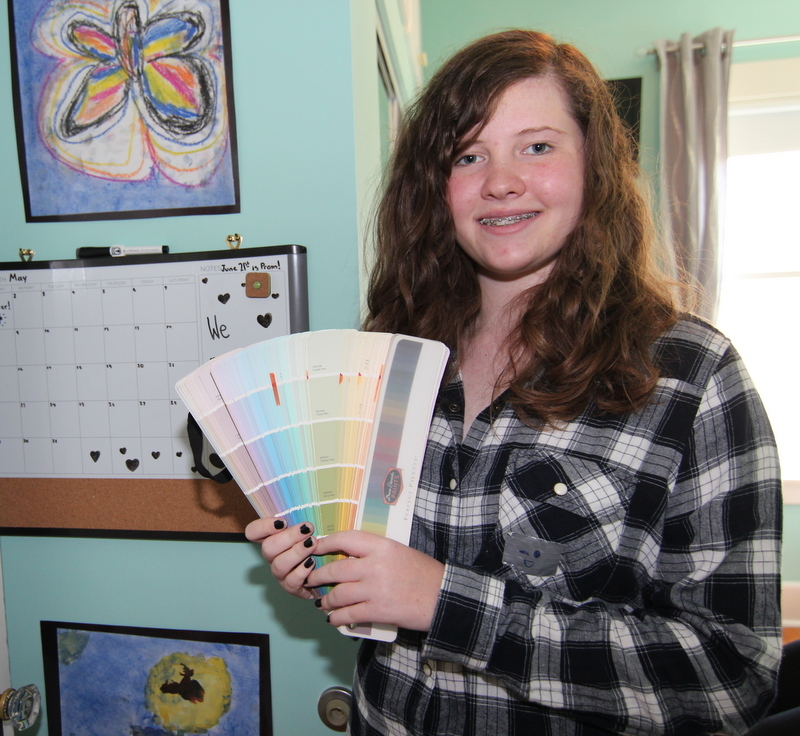 We heard about this bright young lady from the family's advocate, Melanie. Vesna lost her Mom, Ruja, after a battle with cancer. Ruja was an exceptional woman who guided Vesna with love and made her a strong, ray of light. 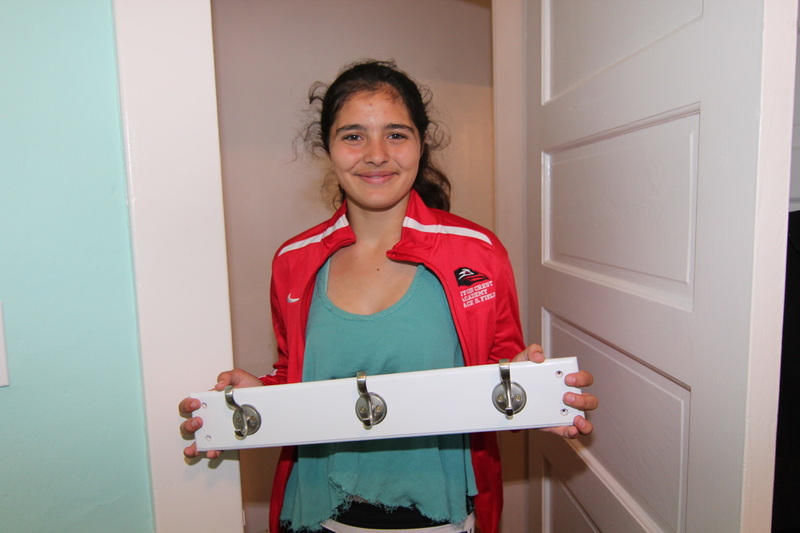 It is largely due to her Mother's influence and strength that Vesna is such a beautiful and strong young adult. 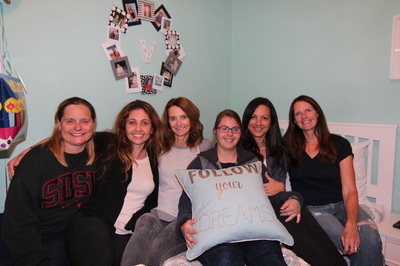 Our team was so excited to help honor her Mother and provide a woman's touch for Vesna as she embarks on a critical transitional time in her life (turning the big 18)! We knew it was the perfect project for our new volunteers, Girl Scout Troop 1224 to step in and surround Vesna with their own love and light. What made Vesna stand out in the crowd amidst the sea of applicants? Vesna is simply put an incredible girl. She is capable and very bright. She is happy, funny and the apple of her Daddy's eye. She was a joy to work with and the girls really loved learning about her life, her likes and dislikes and coming up with a room that fit her needs. Vesna was born with Down Syndrome. As part of our project, the Girl Scouts rolled up their sleeves to learn as much about Down Syndrome as possible so they could be knowledgeable, compassionate and informed when designing a space for Vesna. One in every 691 babies in the United States is born with Down syndrome, making Down syndrome the most common genetic condition. Approximately 400,000 Americans have Down syndrome and about 6,000 babies with Down syndrome are born in the United States each year. Typically, the nucleus of each cell contains 23 pairs of chromosomes, half of which are inherited from each parent. Down syndrome occurs when an individual has a full or partial extra copy of chromosome 21. Vesna is not defined by her diagnosis. 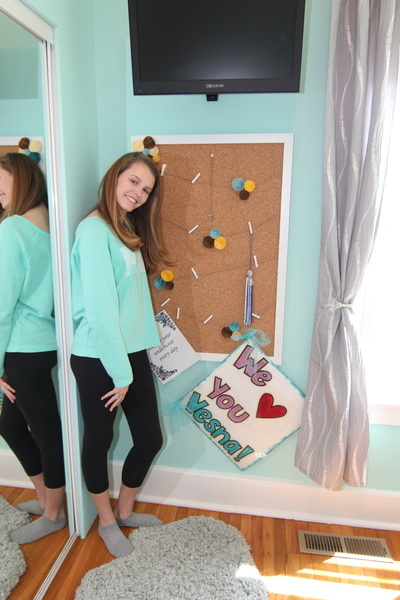 She is an active teen that enjoys music, going to the movies and boys! She is supported by her devoted Father, Branko and loving brother, Vaso. These two men are the rocks in her life and they do their best to ensure Vesna has the extra support she needs to achieve her goals. We hope this new space will provide Vesna with a place to relax, study, and hang out with her friends. 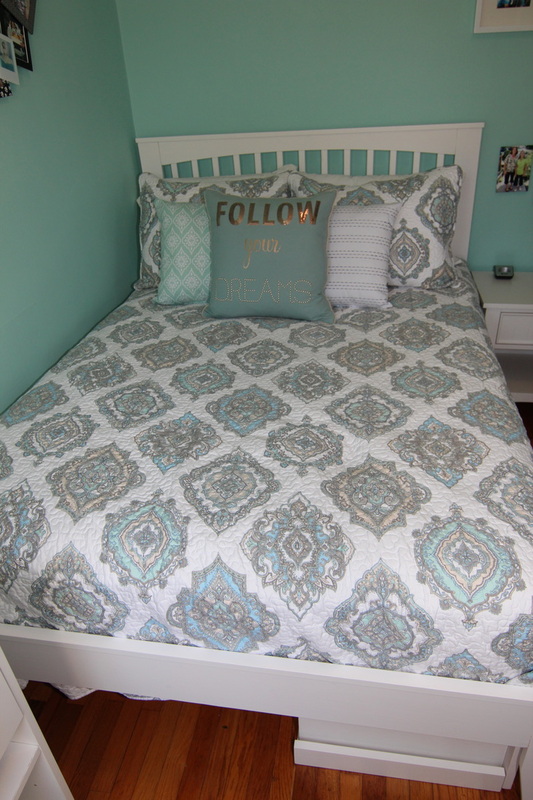 Designed with love, this space is chic and comfortable! We hope it helps Vesna during her transition to life as a young adult. 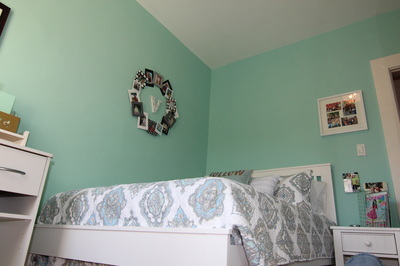 Thank you to Jon Ray of PaintGreen for providing us with the perfect pop of color for Vesna's small space. 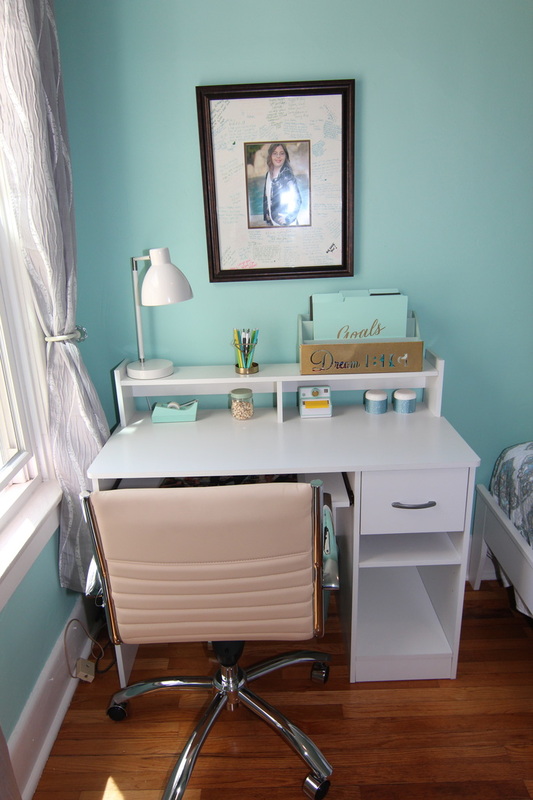 The girls chose Jaded Clouds - and Robert, our talented painter, shared the color is like a waterfall and when someone walks into the room they will be immediately soothed and uplifted. 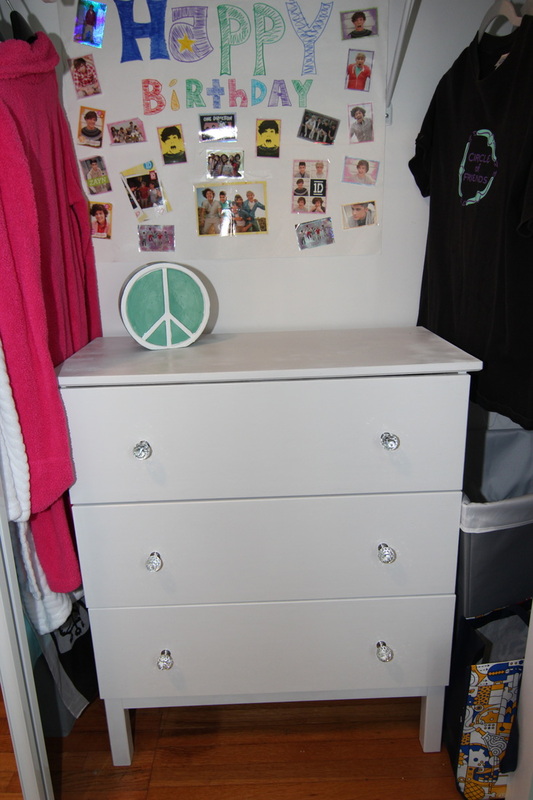 Thank you to John from Mattress Company Direct for the beautiful bed with wonderful storage underneath. Thank you to Bobby for his patience with our team as we fuss about to make the room picture perfect! Thank you to first time Project Lead, Kelly, for not only orchestrating the entire volunteer project, but for hitting it out of the park! Kelly drove every area of this project and we couldn't be more grateful or proud of her efforts. Thank you to Co-Leader Dahlia Jabro for helping lead the room makeover, and for her hard-work with the Girl Scout Journey "Room Renovation" aspect of the project. 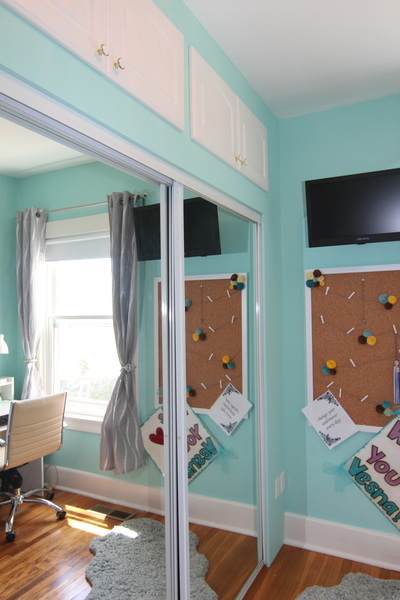 This is a prerequisite for the girls to completing the Gold Award project. Thank you to Robbie Maynard Interiors for helping be our go-to designer! Thank you to Melanie for nominating Vesna and for helping shepherd the communication between the family. And last but not least thank you to our devoted Girl Scouts and their equally devoted parents for their contribution of time, talent and love. This project highlights the spirit of Cecily's Closet - families helping families to make their lives better one room at a time! We are grateful to our volunteers who are truly the heart and soul of our organization. Thank you to Rancho Santa Fe Women's Fund for making Vesna's Sweet Dream room makeover possible! Thank you to Girl Scout Troop 1224 for helping us complete our 79th makeover for children with special needs in San Diego! 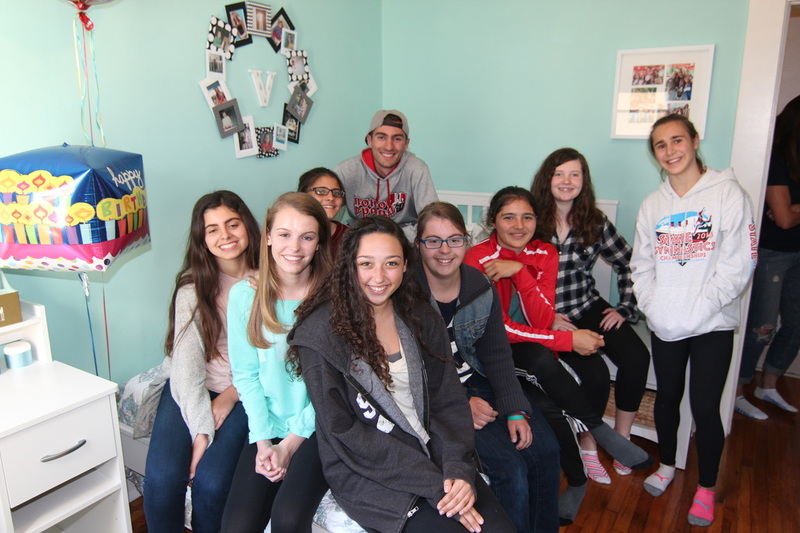 We had seven devoted teens and five wonderful mothers helping us complete the transformation of Vesna's room from child-like to mature space fit for an eighteen year old woman! This Troop is so stranger to community service. In fact, this delightful group of women have already donated their time and talent to make a countless number of belly bands for children with feeding tubes in San Diego County. 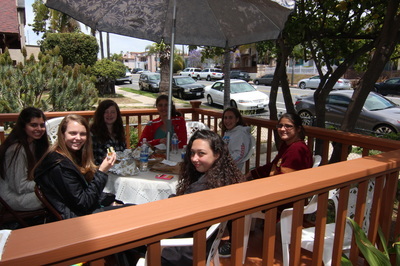 Troop Leader, Kelly, met Cecily's Closet Founder, Rachel, at a Teen Volunteers in Action Meeting a year and a half ago. 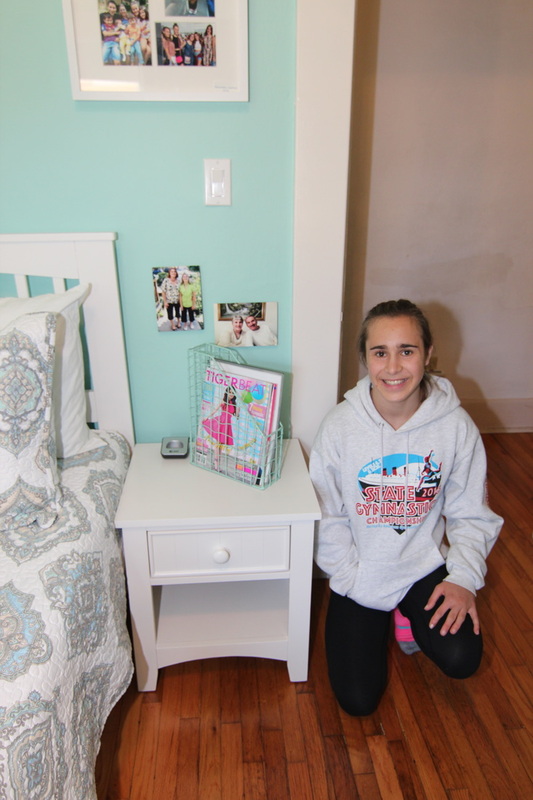 The relationship led to the girls sewing belly bands for Cecily's Closet and grew into the Troop managing Vesna's room renovation. 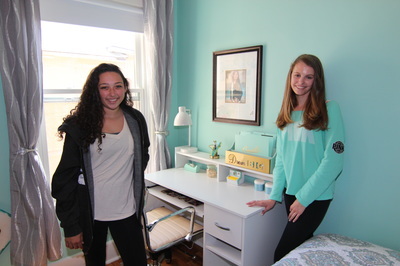 These teens took responsibility for this project on Day one! 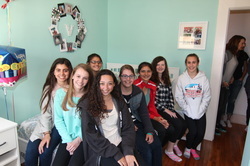 This Troop decided they wanted to do more than volunteer on our install day! 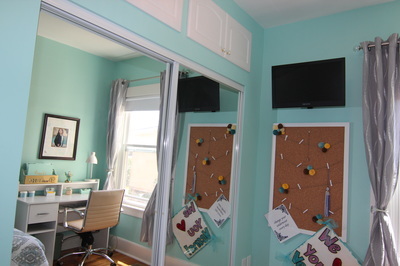 They worked as a team to create tasks that enabled the troop to complete every aspect of this makeover - from design, to shopping, to cleaning, installing and more! 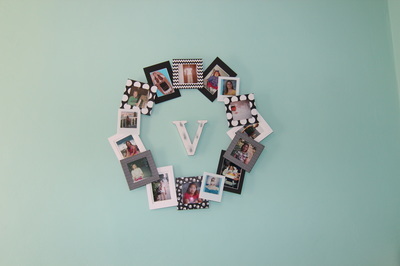 Over the last few months this group of devoted women have carefully curated a design that fits with Vesna's grown up style -- and personalized a space that any teen would be happy to call home. 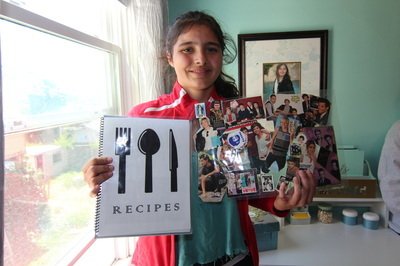 In addition to the custom art, bulletin board and laminated posters, these girls made a custom recipe book for Vesna, a place to keep all of her treasured track and field medals and signs to remind Vesna she is loved. 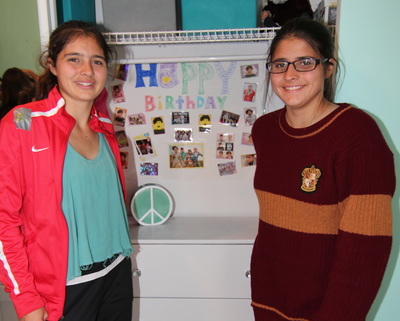 They even came to help Vensa celebrate her 18th birthday! 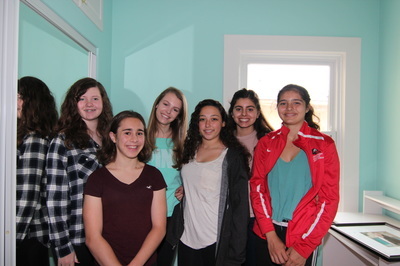 With countless meetings, brainstorm sessions, shopping sprees and craft projects, this Troop left no task undone. We are so proud of their hard-work and we are so grateful for their dedication. We are inspired to see the impact these girls made not just on Vesna's room, but on her spirit Vesna. 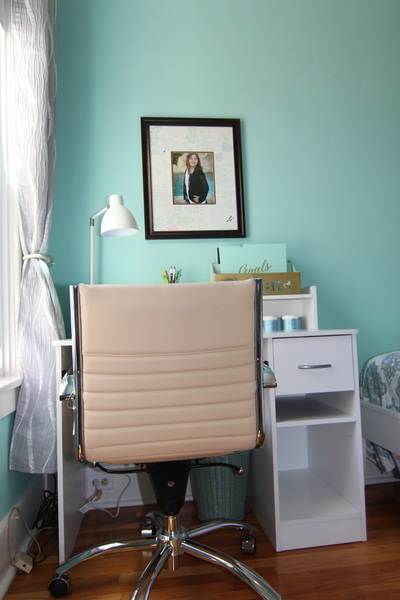 Words simply can't describe how grateful Vensa was for not just the room, but the attention and love she felt during the makeover process. Thank you Girl Scout Troop 1224. We feel so lucky to be working with today's youth on projects like this that make our community stronger. It is our passion to provide volunteer opportunities that empower children and help promote awareness for disability education through fun and rewarding work! Thank you to our wonderful Girl Scouts: Lauren, Peyton, Ashley, Moriah, Abigail, Gaby, Juliana, and Kayla for all of their efforts!